Enjoy the best of both worlds at our Savannah, GA hotel near Tybee Island! Our centrally-located hotel offers guests easy access to the downtown Historic District, while still providing the option to enjoy a sunny beach day. Rinse the sand away in recently-renovated lodgings and enjoy a relaxing meal and drinks at Mudsocks Bar & Grill. 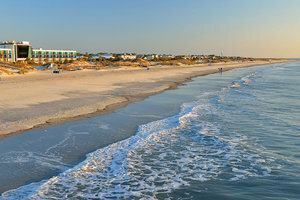 Visit Savannah’s favorite beach during your stay at our hotel near Tybee Island! Drive 43 minutes or 32 miles from our hotel in Savannah near Tybee Island. Follow I-95 N to I-16 E and take exit 167B. Merge onto US-80 E/Island Expy in Whitemarsh Island. Turn left onto 8th Street to access Mid Beach. The island is 5 miles in diameter so walking or biking is one of the best ways to get around. Stop by the Tybee Island Visitor Center at the corner of Hwy. 80 and Campbell Ave. Most streets next to beach access points have public parking. The main beachfront lots are between 14th and 18th Streets or immediately across from the lighthouse at Fort Screven. Download the PARK TYB mobile app for more info. Avoid walking on sandbars. Although they look safe to walk on, the tides rise very quickly and can be very dangerous. Pick your beach! South Beach boasts most of the island’s restaurants and bars while Mid Beach is better for visitors looking to relax. North Beach is ideal for wildlife explorers and Back River Beach is a popular spot for fishing and kayaking. Visit the Tybee Pier and the Tybee Island Marine Science Center for a closer look at local wildlife! 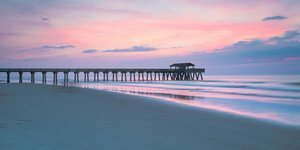 Tybee Island is home to a variety of coastal creatures, such as dolphins, sea turtles, and a variety of beach birds. 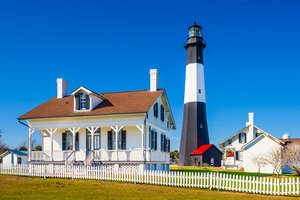 The most popular point of interest is definitely the Tybee Island Light Station & Tybee Museum, a working lighthouse which offers a birds-eye-view and stunning showcase of the island. Book your stay at our Savannah, GA hotel near Tybee Island for quality accommodations in a central location close to the beach!